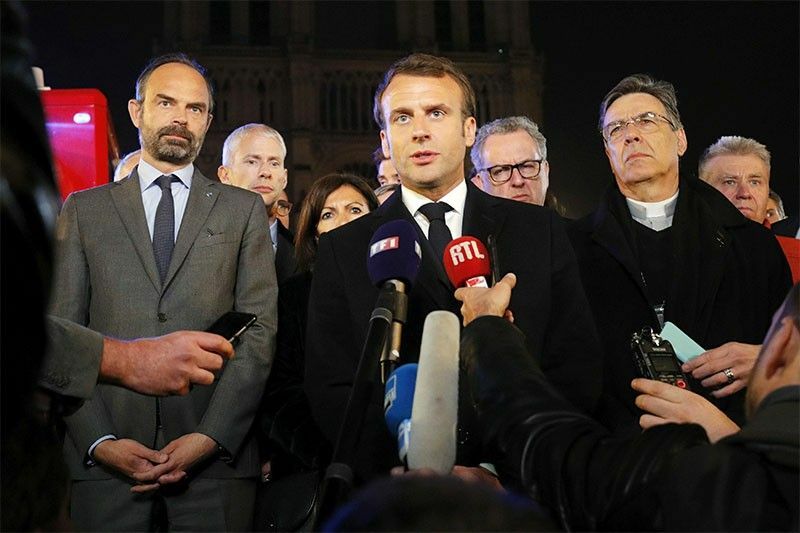 French President Emmanuel Macron (C) is accompanied by Mayor of Paris Anne Hidalgo (3L), French Prime Minister Edouard Philippe (L) French Culture Minister Franck Riester (2L) and Archbishop of Paris Michel Aupetit as he speaks at Notre-Dame Cathedral in Paris on April 15, 2019, after a fire engulfed the building. A fire broke out at the landmark Notre-Dame Cathedral in central Paris, potentially involving renovation works being carried out at the site, the fire service said.Images posted on social media showed flames and huge clouds of smoke billowing above the roof of the gothic cathedral, the most visited historic monument in Europe. PARIS, France — French President Emmanuel Macron has vowed to rebuild Notre-Dame Cathedral in Paris, after a colossal fire tore through the building, sending the spire crashing to the ground and wiping out centuries of heritage.